Nowadays people are more conscious about the beauty special of skin, hair and nails. Now they don’t need to spent lot of money behind the branded beauty products to increase and maintain their beauty. 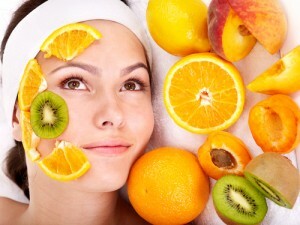 There are lot of products in your kitchen which helps you to enhance beauty of your skin, hair and nails. 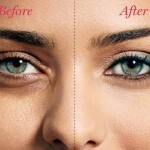 To remove the dark circles under your eyes, you can apply cucumber or potato juice on the eyes with cotton balls. Or can use just wrap a grated raw potato in cheesecloth or just only take potato round chips and apply it on eyelids for 15-20 minutes. Then wipe out the residue and apply an eye cream. You can also apply cucumber or potato juice or mixture of lemon and tomato juice on the eyes with cotton balls. Application of used cold tea bag will soothe the eyes and cure dark circles of the eyes. Sea salt is the best product for the skin exfoliation. It removes dry, flaky and dead skin. This is called sea salt scrub. For that just wet face and apply sea salt on your face, then gently massage with a wet wash cloth or only by fingers. 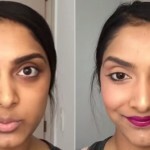 Mostly focus on the cheeks and T-zone, but avoid the eye area. You can use this scrub on anywhere on the body. You can do this once per week maximum. One of the most efficient home remedies for wrinkle removal is massaging the face by coconut oil before going to bed. Massaging the skin with pure castor oil also prevents wrinkles. Cucumber juice and lemon juice is also best for the wrinkle and will help to fade away the blemishes. You can also apply the mixture of honey, olive oil and cream. Leave metal spoons in the freezer overnight and in the morning keep the back of the spoons on the eyes. 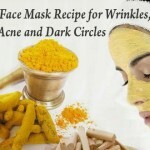 It will cure the eye wrinkles and the under eye dark circles. When you massage your skin with any cream, softly massage it on upward direction, this will also help you to prevent wrinkles. You can use Aloe Vera for the hair as a conditioner. Mayonnaise is also good for the hair as a conditioner. You can use lemon for hair highlights and lightening elbows, beer for shiny hair. For the dry hair you can use the mask of coconut milk and gram oil. For this take a cup of coconut milk and two tablespoon of gram flour. Apply this mask on the scalp and massages. And rinse the hair after five minutes. The best way to manage the oily hair is frequently washing the hair with the mild shampoo. Apply the puree of carrot for 15 minutes before washing hair. Applying astringent in scalp is also another best way. This will absorbs the excess oil from the hair. Soak your nails in water with lemon juice or lemon slices. The lemon acts as an astringent and will strip away stains . Once your hands are dry, you’ll only need to put on a couple of coats of a clear topcoat. For whitening the nail, just use the common whitening toothpaste. Try scrubbing your nails with Pearl Drops, it’s just as easy as achieving a pearly white smile and will take away any stains and shine up your nails. Add lemon juice or slice in water and then soak your nails in it. Lemon acts as an astringent and will remove the dirt and stains from your nail. Once your hands become dry, you only need to put coats of a topcoat. For whitening the nail you can use common whitening toothpaste. Scrub your nail with pearl drops. It is just easy as achieving a pearly white smile and this will shine up your nails. There are also different face mask that you can make at home. Just mix 1 tbsp fuller’s earth and honey and papaya and put it on your face for 20 minutes and then rinse off. Orange yogurt mask is also beneficial. Yogurt will cleanse and nourish your skin and orange is full of vitamin C and AHA’s. 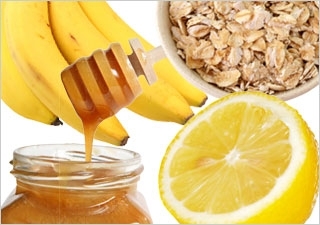 There are many other facial masks which you can easily prepare at home only. Rather than using harmful chemical products to enhance the beauty , these natural products lying in kitchen is more effective safe from side effects.